Painted sign on the side of the Shaw Building. Photo courtesy of Lawrence Herzog, November 1999. Drive around the heart of Edmonton and you’ll see them. Worn by time, pounded by the elements but still clinging to the bricks or concrete on which they were painted so many years ago, they are signs from a vanished and often forgotten time. Early in the 20th century, painted signs were a big part of advertising in Edmonton, and by the 1950s there were more than 100 of them scattered around the city. Buildings with a wall large enough for a sign and with good visibility were always in demand by sign companies. From coffee to cafes, nylons to groceries, soup to nuts, painted signs reached out earnestly with their message. Companies like Hook Signs employed painters, called Walldogs, that specialized in creating signs on the sides of buildings. The earliest ones were painted right on the wood siding of frame buildings, like M. Rosenberg General Merchant, a little store on 95th Street. A photo from the Hook Signs collection at the City of Edmonton Archives, taken around 1911, shows a painted sign for Magic Baking Powder that sprawled over the entire north wall of the building. Painted sign on the side of the A Macdonald Building. Photo courtesy of Lawrence Herzog, November 1999. That building is long gone, as are many of the signs from the golden age, but a few of them still cling to the bricks. Some show the passage of time with newer paint over older, like the east face of the A. MacDonald Building at 10128 105 Avenue. More recently the building was home to Macdonalds Consolidated – and that’s the sign that dominates the long east-facing wall of the structure. But the building has also been home to H.H. Cooper & Company and, if you look closely, you may be able to discern the original sign under the newer one. One of my favourites, now partially obscured from view, is the south-facing wall of the original Shaw Building at 10229 105 Street. 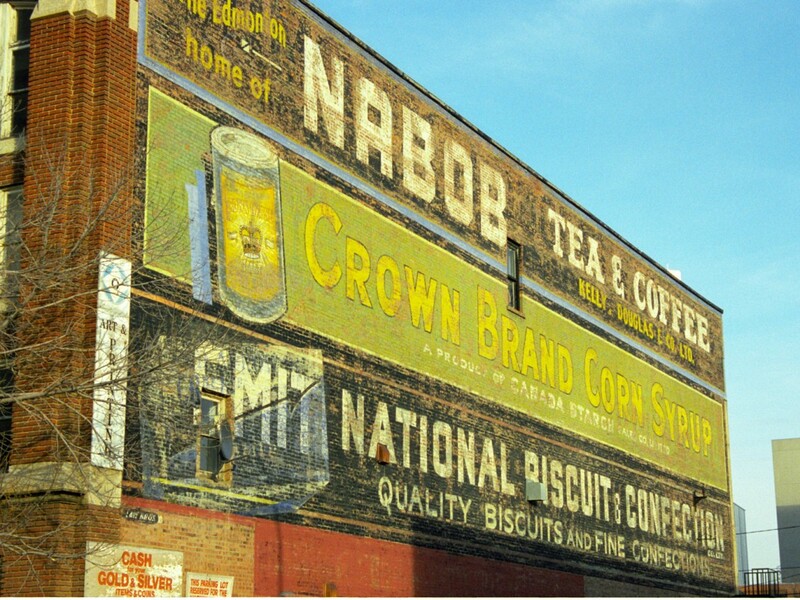 In the years after the building was completed in 1914, ads were painted on for Nabob coffee, Crown corn syrup and National Biscuit and Confection. When I was a kid and we used to drive by in the 1960s, I would always look for the Nabob coffee sign. It meant that as we headed north on 105th Street, we’d soon be coming to the giant overpass and the view down along the Canadian National Railway yards. In the 1920s the west wall of the Gibson Block at 9604 Jasper Avenue was covered with painted signs, including one for the Gibson Café that noted the establishment employed “White Help Only.” When the building was restored in 1994-95, the faded sign was painted over. Nearly hidden now by higher buildings, a little gem of a sign can be found on the east-facing wall of the Birks Building at 10113 104th Street. It’s a rendering of a diamond that actually protrudes from the brick. For more than 50 years, the building was home to another historic sign – the rooftop CJCA radio tiger. Another survivor resides on the east-facing side of the Union Bank Inn at 10053 Jasper Avenue. It advertises James Richardson & Sons grain merchants, who took over the building from the bank in 1928. At its mid-century peak, Edmonton boasted a collection of painted signs that easily topped 100. Now, just a couple of dozen of these so-called “ghost signs” survive through luck and, in some cases, the heartfelt appreciation of owners. Other North American cities have established policies to protect their painted sign heritage. Edmonton is moving tentatively to do the same, while there’s still something left to save. Once they are gone, they are lost forever. City heritage planner David Johnston is hoping to complete a full inventory of all of Edmonton’s painted signs. Preserving them would ensure a continued connection to the advertising styles and artistry from the city’s formative days. Lawrence Herzog has been writing about history and heritage for more than 25 years.